The Netherlands is a leading agricultural producer and the third largest agricultural exporter in the world, after the United States and France. However, its organic agricultural sector, despite some efforts to catch up over the last couple of years or so, when compared to overall agricultural production and/or to some other EC countries, is still rather small. With currently about 1.4 percent of total agricultural area under organic production and organic consumption being around 1 percent of total consumption, the organic market in the Netherlands is among the least advanced of Europe. During the major part of the 1990s, organic products were virtually sold only through specialized organic shops and subscriptions/farm sales (i.e. direct sales arrangements between farmers and consumers). Therefore, a wide range of consumers, who purchase their food in conventional supermarkets were not reached and did not become familiar with the existence of organic products. The introduction of organic products in supermarkets in the second half of the 1990s, as well as government policy to stimulate primary producers to convert to organic farming methods and to increase consumer awareness, contributed to a strong increase in organic sales in the Netherlands. The organic sector received a major boost when the leading Dutch retailer developed its own organic brand in 1998. The organic sector accounts for only 1.4 percent of total agricultural production, in spite of the dynamic growth of organic farms and the area under organic cultivation that took place over the last decade (Table 1). During 2000, the number of organic farms increased by 174 to 1 390. 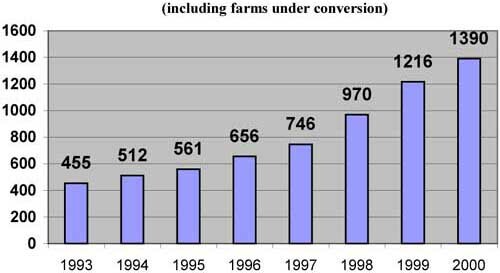 Due to a support programme launched by the government in September 2000, which includes financial assistance to primary producers during the first years of conversion, the growth rate is expected to increase in 2001. The target of the policy is to have five percent of the total area under organic production by 2005 and 10 percent by 2010, or 200 000 hectares. The main production region is in the centre of the Netherlands, in the polders (ground which was formerly under the sea) of the province of Flevoland. The leading production cooperative is Nautilus, which has a total area of about 5 000 hectares. Fruits and vegetables account for almost 30 percent of the total of organic production, followed by livestock products. The fastest growing sector, however, has been the production of organic mushrooms; the number of mushroom farms doubled from 21 to 42 from October 1999-October 2000 (EKO-Monitor, October 2000). This brings the total estimated mushroom production at 130-150 tonnes/week, or 3 percent of total domestic mushroom production (Rabobank, 2000). Some organic products have a significantly higher market share than others. The organic dairy sector (excluding butter) accounts for a sales value of f.46 million, or 2.3 percent of total dairy sales (EKO-Monitor, October 2000), which is over 9 percent of total organic sales. Other important products include mushrooms (3 percent of mushroom production is organic) and apples (2.5 percent of area under apple production). In 1999, total production of organic fruits and vegetables reached 65 000 tonnes, with an estimated production-value (at farm-gate level) of almost f.70 million. Total area under organic production is estimated at 2 100 hectares of which 1 800 ha is for horticulture, 260 ha for fruits and 40 ha for organic production in greenhouses (see Graph 2) (Productboard for Horticulture, 2000). About 300 farms produce organic vegetables, on approximately 1 800 ha, or 2 percent of the total area under vegetable production. Total production is estimated at 50 000 tonnes. The most important products are onions (400 ha) and carrots (220 ha). The other major organic vegetables include butter-beans, cauliflower and chicory. These five vegetables account for over half of the area under organic vegetable production. Other products are broccoli, cabbage (white and red), leek and endive (Productboard for Horticulture, 2000). The yield of organic vegetable production is on average 70-90 percent of the yield of conventional production, as is shown in Table 2. Source: Productboard for Horticulture, 2000. Conventional production of vegetables in greenhouses is widespread in the Netherlands. However, greenhouse production of organic vegetables continues to be limited, with a total area of 40 hectares in 1999. Nevertheless, as shown in Graph 2, the total value of organic greenhouse production is an estimated f.20 million, a large total in the context of the small organic production total. The main vegetables produced are tomatoes (including different varieties such as cherry tomatoes) with 8 ha, cucumbers with 8 ha and paprika with 5 ha organic production in greenhouses is growing fast, but from a small base, and for the third quarter of 2000, the total area was estimated at 51 ha. Economic factors during the conversion period; over the last few years (1998 and 1999) prices of apples were low. Poor yields and low expected earnings do not encourage farmers to convert. Other matters, such as fiscal arrangements and lower VAT on organic products. The total amount of organic retail sales in the Netherlands differ according to various sources. An ITC study on organic food and beverages (ITC, 1999) states that total organic sales in the Netherlands were f.700-800 million for 1997. However, during interviews, many market sources estimated total organic sales at about f.500 million for 2000. In April 2001 Rabobank, a Dutch bank, estimated that sales of organic food in the Netherlands would rise to f.730 million at the end of 2001, accounting for 1.2 percent of total food sales. The bank estimated total sales of organic products to rise to f.870 million by the end of 2002. The specialized organic shops have been the main retail channel until the year 2000 and accounted for an estimated turnover of f.257 million - more than half of total organic sales. Supermarkets, until some years ago (virtually absent in the organic sector) have organic sales of around f.150 million. The biggest supermarket chain, Albert Heijn, which launched its own organic brand in 1998 ("AH biologisch"), had f.120 million in organic sales, a 78 percent share of total organic sales in supermarkets in 1999 (LNV, 2000). Other sales channels include weekly markets, subscription schemes and farm sales, which account for an estimated total of f.120 million. In March 2001 a consultant agency, Aurelia, estimated that at the end of 2001, supermarkets would have become the most important sales channel, with 45 percent of total organic sales, compared to 42 percent for specialized shops (Distrifood, 2001). In the period between 1995 and 1999, the number of specialized organic shops increased from 280 to 400. Over the same period, supermarkets that sell more than 15 organic products increased from 70 to over 4 000 (the total number of supermarkets in the Netherlands is 5 500). Therefore, organic sales through supermarkets is the fastest growing retail channel. In 1999, about 60 percent of consumers bought organic products in supermarkets, 30 percent bought them in specialized shops, and 15 percent through subscriptions or farm sales. With the introduction of organic products in supermarkets, a wider range of consumers has been reached - consumers who are less sensitive to health and "green" issues, but are more price conscious. This has, on the one hand, led to more people becoming familiar with and interested in organic products. These buyers are potentially new clients for specialized shops, as the availability of organic products creates an incentive to purchase beyond the assortment of the supermarkets. On the other hand, however, clients who used to buy some organic products in specialized shops and the rest of their food in supermarkets, might prefer the convenience of buying all their food at one place at a time. Therefore, this group of clients might abandon the specialized organic shops. Data available at the time of writing (mid 2001) show that, so far, these two opposite forces have balanced each other out; that is, the total number of clients going to specialized shops has not changed over the last year. The annual growth of around five percent in specialized organic shops has derived from higher purchases per client. The average expenditure per consumer in an organic specialized shop is estimated at f.22 (EKO-monitor, October 2000). However, the introduction of organic products in supermarkets, has put retail prices in organic specialized shops under pressure. In the forthcoming years much will depend on whether specialized shops will be able to develop into a sort of organic supermarket, as well as on the range of organic products supermarkets will continue to have. In order to combat increased competition from supermarkets in the second half of 2000, the specialized organic shops decided to modernize their outlets and to become a kind of small supermarket chain for organic products. 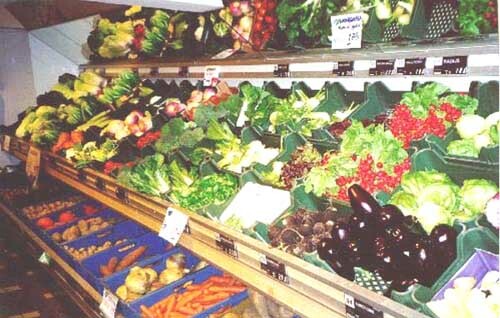 The umbrella organization of specialized organic shops (NWO - Natuurwinkel Organisatie) recognizes that the growth of their organic sales lags behind growth rates in supermarkets due to the generally disordered, old-fashioned and limited surface in the outlets (Levensmiddelen-krant, 2 October 2000). An example of how the "ideal" organic shop would look is an outlet in Rotterdam called De Groene Passage (The Green Passage). This small supermarket, sells a wide range and variety of products, including many fresh fruits and vegetables (see Picture 1). The increasing availability of organic fruit and vegetables in supermarkets seems to have a negative impact on subscription schemes. The fast growth of subscribers observed in the second half of the 1990s has stopped, and the number of subscriptions is going down slowly. Source: Picture taken by author, October 2000. About two-thirds of domestic production of organic fruits and vegetables (42 000 tonnes) is exported, mostly to England, Germany, Denmark and Sweden. At the same time, retailers, especially supermarket chains, have expressed their concerns about insufficient domestic supply. Therefore, the lack of information and a non-optimal functioning organic chain seem to be important issues (Productboard for Horticulture, 2000). The explanation for the high number of exports of domestically produced organic fruits and vegetables is that consumers in neighbouring countries are willing to pay higher prices than local consumers. Producers and traders can obtain a significantly higher price for their produce abroad (see also "consumer attitudes"). One-third of domestic production (23 000 tonnes) is sold through various domestic retail channels. Since imports of organic fruits and vegetables are estimated between 17 000 and 22 000 tonnes (see chapter IV), the actual size of the Dutch organic market for fruit and vegetables is estimated between 40 000 and 45 000 tonnes (1999 figures). Several sources (e.g. traders, retailers and various studies) indicate that price premiums over conventional fruits and vegetables range from 0 to 200 percent, depending on the product, season, outlet, etc. Precise figures could not be obtained, but the authors own observations during October 2000 (week 42) in different supermarkets throughout the country confirm the above price range. Price premiums for organic products were observed from 8 to 150 percent above prices for conventional products (see Table 3). Table 3: Retail prices (in Dutch guilders) of selected organic and conventional fruit and vegetables in supermarkets in the Netherlands and the percentage price premium. Source: Authors observations, October 2000. Specialized organic stores are the main outlet for organic fruit and vegetable sales, with around 50 percent of total sales, followed by subscription schemes, a popular way through which organic fruits and vegetables are sold. Every week subscribers receive a bag of fruits and/or vegetables, mostly those in season, but also imported produce. Subscription schemes are estimated to have grown to 40 000 in 1999, and stabilized since then (LNV, 2000). However, as mentioned before, the influence of supermarkets selling organic fresh fruits and vegetables has placed a strong competitive pressure on subscription schemes, and towards the end of 2000 a slight decrease in the number of subscriptions has been observed. Supermarkets rank third in sales of fruits and vegetables (in overall organic sales supermarkets are second, see above). Finally, a fourth retail channel is the boeren-markten (farmers markets), weekly markets where organic products are sold - often by the producers themselves (see Graph 3). These markets are found throughout the country. The main products sold include fresh fruits and vegetables, meat and milk. As of November 2000, there were 33 organic markets in the Netherlands (Ecomarkt, 2000). The umbrella organization for farmers markets (Stichting Landelijk Platform Biologische Markten) expects that the total number of these markets will continue to grow, reaching 50 in 2005. 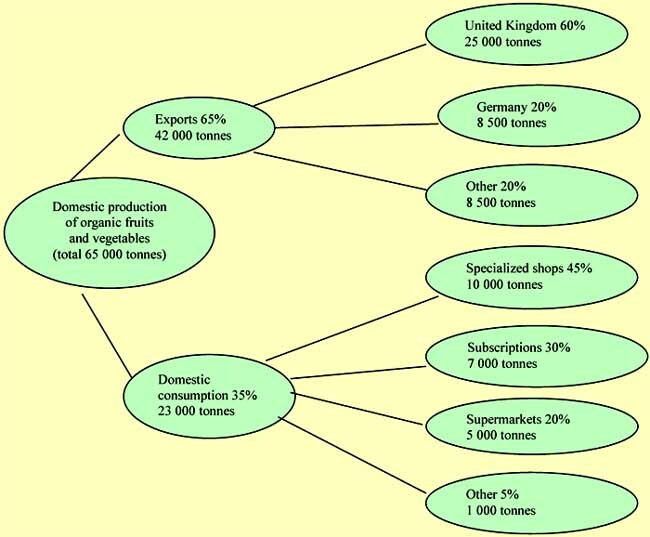 Graph 3: Dutch-produced organic fruit and vegetables: To where do they go? About 96 percent of Dutch consumers have heard of organic foodand know of the existence of organic certification labels, but around three quarters of them do not know what those labels stand for, nor are they able to indicate the advantages and disadvantages of certified organic products. 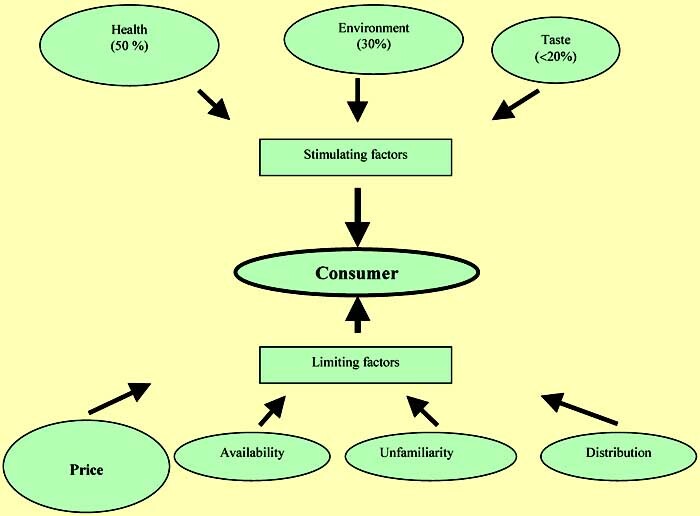 The Ministry of Agriculture, Nature Management and Fisheries of the Netherlands distinguishes four different groups of consumers: (i) the heavy users; (ii) the selective purchasers; (iii) the connoisseurs; and (iv) the non-connoisseurs (LEI, 2000). For details on characteristics of each of these groups, see Table 4. To increase the share of organic food in total consumption,the heavy users and selective purchasers are identified as the most interesting. Research has been done on the main consumer determinants on whether or not to purchase organic products (LEI, 2000). These stimulating and limiting factors are given in Graph 4; the percentages give the importance of the factor. For about half of all consumers, the most important reason for buying an organic product is health (partly due to the guaranteed absence of chemical residues and GMOs). Other reasons are the environmentally friendly way of production and better taste. Opposed to these stimulating factors, there is a series of limiting factors. Although precise percentages are not available, some market sources state that the prices for organic products compared with conventional products is the overriding limiting factor for Dutch consumers. Various traders and retailers confirmed this during interviews. They also mentioned that the average Dutch consumer considers health and environmental factors (i.e. stimulating factors; see Graph 4 above) as long as they are not reflected in higher prices. Even a low increase in price (up to 20 percent above conventional price) might prevent Dutch consumers from purchasing organic products. The current price premium, however, is generally higher and in some instances much higher (up to 200 percent more) than the price for conventional products. Other limiting factors, besides the price, include: (i) limited availability of organic products in conventional retail channels (supermarkets); (ii) unfamiliarity of consumers with the EKO-label; and (iii) small-scale distribution, inducing higher costs, which in turn leads to a vicious circle of small turnover, therefore higher prices and consequently small turnover, etc. Moreover, some market sources indicate that many Dutch consumers distrust the reliability of organic labels and of the organic certified production process. Besides the attitude of consumers towards organic products and their price, there are other factors that may further limit market expansion. A comprehensive study carried out by KPMG for the Ministry of Agriculture, Nature Management and Fisheries (LNV, 2000) identified a wide range of bottle-necks in the Dutch organic sector, including: (i) lack of coordination of market players; (ii) no guarantee of the sales possibilities; and (iii) poor communication. The study maintained that the overriding limiting factor for further expansion of the organic fruit and vegetable market lays on the production side. Many farmers expect that prices for organic products at the farm-gate level will decrease in the forthcoming years. They are therefore less enthusiastic to convert from conventional production. A second factor depressing further market development is limited willingness to pay a significant price premium for organic products by Dutch consumers (see above). The basic regulations on organic imports are those set out in Council Regulation (EEC) No. 2092/91. However, organic certification is only one of the requirements needed to enter the Dutch market. Importers are requested to specify precisely the product profile, its quality standards and packaging/labelling requirements against which each delivery will be inspected. A major obstacle to supplying Dutch importers is the transport and storage of fruits and vegetables, which must adhere to organic regulations and must ensure that top quality products reach the consumer (ITC, 1999). The Ministry of Agriculture, Nature Management and Fisheries appointed SKAL as the organization accredited to certifying organic producers. SKAL also inspects and controls whether organic production requirements are met. Regarding imports from third countries (those which are not on the EC list of third countries, as described in Council Regulation (EEC) No. 2092/91, Article 11), import licenses should be obtained through LASER2, based in Roermond. This authority is part of the Ministry of Agriculture, Nature Management and Fisheries. Although the Netherlands does not collect official data on imports of certified organic products, it is a major importer. Dutch companies play an important role in import/export trade and large quantities (up to 80 percent) are re-exported, mostly to other European countries. It has been difficult to obtain reliable quantitative information on organic imports. In addition, interviews of importers have not always resulted in precise indications of imported quantities. Some traders have a restricted policy towards providing information on their imports, while for others, the Dutch market is only a small fraction of their total traded volume. For example, EOSTA, the largest Dutch organic trader in fruits and vegetables obtains 95 percent of its total turnover outside the Netherlands. Although based in the Netherlands, their main markets are Western Europe (Germany, United Kingdom and Scandinavia) and the United States. Another complicating factor in the compilation of data on imports of organic fruits and vegetables is that a large amount of imports go through Belgium (Antwerp). It is not always easy to obtain figures on imports from the country of origin. What follows is an estimation of imports, based on various sources of information, including interviews with importers and traders. As shown in Graph 3, about 35 percent of domestic production of organic fruits and vegetables (23 000 tonnes) remains in the country. Many sources commented that about half of the domestically consumed organic fruits and vegetables are imported. Therefore, the total domestic market for organic fruits and vegetables is estimated at around 42 000 tonnes, with imports ranging between 17 000 and 22 000 tonnes. Note that this is only a rough figure; generally, the percentage of imports in total consumption figure of organic fruits is higher (60 percent) than for vegetables (40 percent), with fluctuations during the year dependent on the domestic harvest. Some traders indicated that the imports of organic fruits are increasing fast, not only in absolute figures, but also compared with imports of organic vegetables. Table 5 gives estimates of organic fruit and vegetable imports per product for the year 2000, based on interviews with importers and traders in the organic fruits and vegetables sector in the Netherlands. Apples, pears, citrus fruit, onions, bananas, grapes, kiwi and tomatoes are the major products imported. In smaller quantities, mangoes, avocados, garlic and ginger are also imported. Source: Authors calculations based on market survey. Note that the above table tries to identify import quantities of products consumed within the Netherlands. Total imports of organic fruits and vegetables are much higher, since the Netherlands, due to its geographical location and well developed infrastructure with the major port of Rotterdam, is a main entrance gate for Europes hinterland. Precise quantities of re-exports of these products could not be obtained, but are for some products only a small proportion is domestically consumed. For example, total imports of organic bananas are estimated at about 8 500 tonnes (preliminary figure for 2000), whereas the domestic consumption of organic bananas is estimated at around 750 tonnes. Therefore, over 90 percent of imported organic bananas is reexported. There are some major players in the Dutch organic market for fruits and vegetables. Most of them are involved in imports, exports and domestic trade. The organic market in the Netherlands is relatively small, and generally, these companies operate at a European rather than a Dutch scale. Calculations of the Greenery estimated that, in 1998, the main six market players had the following market share in the organic fruits and vegetable sector (Groenten en Fruit, 03/12/99): Eosta (25 percent), Zann (21 percent), Odin (12 percent), Nautilus (11 percent, Bick (5 percent) and the Greenery (1.5 percent). Based on interviews with traders and importers, it is expected that the Greenerys market share, through its Disselkoen Organic BV enterprise, will take up a position in the top three, mainly thanks to its organic exports. Note that the above list does not include Trabana. Specialized in the import of organic tropical fruit, Trabana is among the most important European importers of organic bananas, accounting for about 20 percent of total European imports of organic bananas (year 2000). Although the Dutch organic market is growing, various factors might limit a further expansion of the market and/or organic imports. As already mentioned, the limited willingness of the average consumer to pay a price premium over conventional products of more than an estimated 20 percent is important. As long as the price gap between conventional and organic products continues at the same range (sometimes up to 200 percent), no sharp increase in demand is expected. At the same time, domestic organic production of temperate zone products (mostly vegetables) and greenhouse production (peppers, tomatoes and cucumbers) is catching up, stimulated through Government policy with subsidies for the conversion period. For these products, it is more likely that the Netherlands will become a major organic exporter instead of an interesting import market. Therefore, an increase in imports is most likely for other products, such as exotic and off-season fruits and vegetables. As referred to in part 2, there is a certain distrust among groups of consumers about the reliability of certification mechanisms abroad, which is an additional constraint to import growth. Moreover, generally, importers and traders express their preference for products from those countries, from which the transport distances are shortest ("as close by as possible, as far away as necessary"). Despite the wide range of factors with a possible negative impact on a further increase in demand for organic fruits and vegetables in general, there are also opportunities for an increase in imports of certain products from third countries. Supermarkets, the fastest growing outlet in organic sales, prefer to sell year-round products at a stable price and quality. However, currently, they express that only a limited range of products meets those conditions. This is confirmed by research among 125 supermarket managers, in which 61 percent of those interviewed were dissatisfied with organic products, especially the price-quality ratio of organic fruits and vegetables (EKO-Monitor, October 2000). Therefore, in order to enable year-round supplies in sales outlets, developing countries, especially those in the southern hemisphere, could take advantage of this and supply the Dutch (and European) markets during the northern winter, when domestic production is virtually absent. Secondly, with the growing awareness among consumers of the existence of organic products among consumers and the increasing distrust in conventional products, a rise in imports of organic fruits and vegetables is likely for those products not produced in the northern hemisphere, especially exotics. Examples include, among others, banana, mango and pineapple. Finally, with the well established infrastructure and a long history of imports and re-exports, the Netherlands provides a significant gateway into the European hinterland. Dutch traders are highly experienced and are accustomed to working with producers from the initial stages of conversion and certification. Even if the growth of the Dutch organic market for fruits and vegetables continues to lag behind the growth in other European markets, imports into the Netherlands are likely to increase in the forthcoming years. The Dutch organic market gained momentum in the late 1990s. Supported by Government policy, the number of farms being certified organic has sharply increased, with growth rates up to 30 percent per year. Furthermore, consumers have become more familiar with the national organic label (EKO-keurmerk), and organic sales have increased significantly during the last few years, although the growth has been from a small base and at a lower pace than in many other European countries. However, the Dutch organic market is expected to continue to grow, and with the introduction of organic products in the major supermarkets some years ago, a new group of consumers has been reached. Although consumers generally express concern about their health and the environment and indicate a preference for food being produced in a (more) sustainable way, the overriding limiting factor for further expansion of the organic market seems to be the unwillingness of the average Dutch consumer to pay a price premium of over 30 percent above the price of conventional products. Moreover, living in the worlds third agricultural exporting country, Dutch consumers are used to pay low prices for agricultural products. A strong consumer price-consciousness results in the fact that about two-thirds of nationally produced fruits and vegetables are exported, mostly to countries close to the Netherlands, such as Germany and the UK. Producers and exporters frequently indicate that they get a higher price abroad; consumers in those countries are willing to pay a higher price. Supermarkets are increasingly important as a sales outlet for organic products. Moreover, it is expected that the specialized organic shops, still the main retail channel (in the year 2000), will become more professional in the next few years so as to be able to continue to compete with conventional supermarkets. The example of the "organic supermarket" in Rotterdam (see section 2) is what many interviewed traders and key informants expect to be the way in which the major part of organic products will be sold in the Netherlands in the not so distant future. Currently, supermarkets find it difficult to provide year-round fresh organic produce to their clients at constant prices (more importantly for fruits than for vegetables - which are mostly produced domestically). Therefore, in order to guarantee year-round organic supplies to consumers, high potential exists for those products which currently are not available throughout the year. Such off-season supplies provide clear opportunities for countries from the southern hemisphere, which have comparative advantages during the northern winter to provide fresh fruit. This will be especially the case for perishable fruits (such as grapes), which are more difficult to store. Opportunities for developing countries in exporting stonefruit and citrus fruit to the Netherlands might face serious competition from the already well established organic export sector in Spain and Italy. The often heard slogan "as close by as possible, as far away as necessary" underlines that (potential) importers will try to purchase their products in those countries from which transport to the Netherlands is minimal. A second important opportunity exists for tropical fruits and vegetables (which cannot be produced in Europe due to climatic conditions). These products are imported, allowing third countries to supply the market. Opportunities for other products are less clear. An important potential factor of growth lies in a lower price difference between organic and conventional products. Being a major importer and re-exporter, the Netherlands is an attractive entrance to the European organic market in general. The well established infrastructure and a long history of imports and re-exports in the Netherlands provides a significant gateway into the European hinterland. Most of the products entering the Netherlands through its port of Rotterdam continue their journey to neighbouring countries and Scandinavia. Dutch traders are highly experienced and are accustomed to working with producers from the initial stages of conversion and certification. This experience might be of great use for potential organic exporters in developing countries. 1 In the EC, much less organic fruit is generally produced than organic vegetables.